awesome Small House Ideas Lyndoch. The Randall cottages built 1854. Small two room joined cottages now linked as one residence. Randall ran it as a shoeshop and his residence. He was a cordwainer. Sold out of the Randall family in 1911. Lyndoch: First Settlement of the Barossa Valley. Colonel William Light embarked on a government exportation trip in December 1837 as part of his role of Survey General of South Australia. By this time Light was quite ill and the trip was a great trial to him. But he discovered the Barossa Valley which he named after a location in Spain where he had fought during the Peninsula Wars (1807-14) when the allies of Spain, England and Portugal fought Napoleon for control of the Iberian Peninsula. The battle of Barrosa (corrupted to Barossa in SA) was in 1811 just outside of Cadiz in southern Spain. The British and Portuguese drove off the French and kept control of Barossa ridge under the command of Scottish born aristocrat General Thomas Graham who owned the estate called Lynedoch. General Thomas became Wellesley’s (Lord Wellington) second in command and was made first baron Lord Lynedoch in 1814. At Lyndoch Light named the district after his friend and colleague Lord Lynedoch with the correct spelling in his journals but the government maps produced it with a misspelling. So the town name is distinctly Scottish and not German in origin. William Light also named Lights Pass after himself further along the North Para River which flows from north to south through the valley. In January 1839 David McLaren the manager of the South Australian Company claimed the second Special Survey in the state for this district. It was named the Lyndoch Valley Special Survey and E Giles conducted the survey later that year. The Drs William and John Browne from Scotland (and later from Booborowie leasehold) claimed the first surveyed section late in 1839. Other white settlers took up land here in 1840 and the area around Lyndoch had over a hundred settlers by March of 1841. They all had British names such as Browne, Ferguson, Argent, Underwood, Lambert, McEwen, Marchant and Roberts etc. Crops were being reaped by 1842 and the first wind powered flourmill started production in 1842. In 1848 a weekly mail service from Adelaide began. Much of the land in the Lyndoch Valley was owned by the SA Company and they generally leased the land with the right to purchase after seven years rental. Around 25 sections of 80 acres or 20,000 acres was leased from the SA Company by the mid-1840s. Buyers in the late 1840s were paying around £5 per acre for land from the SA Company which the Company had paid just £1 per acre for in 1839. The SA Company leased around 750 acres to thirteen German immigrant families in 1847 at nearby Hoffnungsthal. That infamous little settlement was swept away in a disastrous flood in 1853 and some of the settlers moved into Lyndoch forming the nucleus of the St Jakobe Lutheran congregation which first met in the Union Chapel. Thus began the German influence in the town of Lyndoch. The town of Lyndoch was laid out as a private town on the farming lands of Robert Burfield in 1851 with 147 town allotments. Just two years later it was claimed that the town was well established with a flourmill, several general stores, a blacksmith, wheelwright, butcher and 12 houses. Within the next few years four churches and two schools were established and several hotels or inns. The fertile lands of the valley ensured the town was a great success. In 1854 the first church in the town opened. It was a Bible Christian Methodist Chapel that served as a church until it was rebuilt as a bigger church in 1865.A few years later this church was vacant so it was sold in 1878. It then became the town library and Institute until a purpose built Institute building was completed in 1912. Since 1912 the former church has been a private residence with a treed garden hiding its very Gothic church features. Just a few months later in 1855 a Union Chapel was opened in Lyndoch by the Congregationalists. It was designed for all denomination to use and even some of the early St Jakobi congregation used it for some years before they built St John’s Lutheran in 1880. The Trustees had acquired over 2 acres of land for use as a cemetery and chapel. A small private school began in the chapel too in 1855. It operated in the chapel until 1875 when the government took over responsibility for a school in Lyndoch. The chapel had a mortgage and it was sold in 1875 and the church closed. The Trustees finally gave over their control of the cemetery to the town authorities in 1883 and it became the town public cemetery and it is still in use. The Union Chapel eventually became a Congregational Church and still stands in the town as a small residence. The third church to be built in Lyndoch was the Anglican Church just to the north of the town. It was located on a 20 acre glebe lands acreage granted freely from the state government in 1850. The Anglicans of Lyndoch did not build a church immediately despite government financial assistance being available to do so up until 1851. The Anglican Church was built in 1860. The cemetery across the road was started in 1860 on land purchased from the South Australian Company who had taken out a Special Survey in 1839 on the lands around Lyndoch. The SA Company had offered a couple of acres of land to the Anglicans in the early 1841 for a church and cemetery but the land offered was too swampy and no action was taken and the offer lapsed. A few walls of a church was built but nothing more. So in 1860 Bishop Short purchased this same block of land from the SA Company for the Anglican cemetery for £5. Not long after the Anglicans built their church the Baptists of the region erected their church in 1862 in Lyndoch. After the Gawler to Angaston railway passed close to the church in 1911 the Baptists received some compensation from the railways for the cracks that began to appear in the stone work. They added a transept to their building in 1917 and they also erected a fine bluestone and sandstone quoins Georgian style Baptist manse next to the church in 1866. Meantime the Lutherans also built a church in the town as well as one just outside the town. St John’s Lutheran congregation built a church in the town in 1880 as a breakaway group from St Jakobi church outside the town. It was replaced by the current St John’s Lutheran in 1927 and this 1880 church became the carpark! But the first Lutheran church of sorts opened in Lyndoch in 1855 when Reverend Meucke opened a church and Lutheran school in King Street. It was the Lutheran School in Dr Meucke’s church that became the state school of Lyndoch in 1877 before the new stone state school was erected in 1879. Around 1900 the church closed and the building became a general store and later a residence which it still is. After the flooding of Hoffnungsthal some members of St Jakobi congregation used the Union Chapel for their services. But the majority of the St Jakobi wanted a church of their own. They eventually acquired this just outside of the town towards Williamstown. In 1850 a small non-denominational chapel, known as the Chapel of the Independents, was built as a chapel and a school with no Lutheran affiliations. Then in 1854-55 when two churches were built in the town this chapel was left vacant until the Baptists took it over in 1858. They used it until their own church was completed in the town of Lyndoch in 1862. The chapel school was left vacant until the St Jakobi congregation from Hoffnungsthal purchased it in 1867 for use as their Lutheran Church. A new Lutheran church was built next to it in 1913 and the old 1850 chapel became the Lutheran school room. This property is still part of St Jakobi Lutheran School complex and is used for office administration. The Lord Lyndoch Inn. As the earliest major building in the town it was used from 1847 for public meetings and the government used rooms for leasing land, land auctions, conducting court cases, settling disputes over pasturing of cattle on public lands, meetings for petitioning the government for the creation of a district council etc. 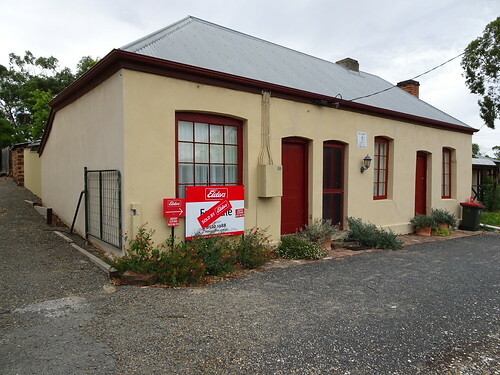 When local government was instituted a meeting was held in the Lord Lyndoch Inn for people to nominate to be councillors in 1855 for the District of Barossa East. To accommodate more people for the meetings etc the new Lord Lyndoch Hotel was built in 1855 further up the street and now beside the railway line which came through the town in 1911. From 1855 all Council meetings (until 1872) and court trials (until 1874) were conducted in the new Lord Lyndoch Hotel as well as annual meetings of tenants of the South Australia Company. Mrs Gower took over the old Lord Lyndoch Inn as publican and ran it until it went into receivership in 1866. From the onwards it appears to have been used as a general store and it is still used for shops. By contrast the Lord Lyndoch Hotel lasted longer as a hotel. But once the owner from 1856 Mr Gower died in 1870 the hotel was soon in financial difficulties. It finally closed in 1872. After years of private use it was relicensed in 1914 as the Railway Hotel as the 1911 railway line had taken away part of its yards. Then around 1920 the license was surrendered and the Railway Hotel became a Temperance Hotel or coffee palace. After a few years it reverted to private use as a boarding house.